Herself an ex-offender, Virla Spencer now helps convicts get their driver\'s licenses back. When Virla Spencer visited district court on work business one day this summer, a woman she didn’t recognize reached through the clerk’s window and grabbed her arm. “I love you,” the woman said. Spencer just looked at the woman, confused, until she explained she had heard Spencer speak at WorkSource, where job seekers find help looking for work. “I got this job because I listened to what you told me and I went for it,” the woman said. 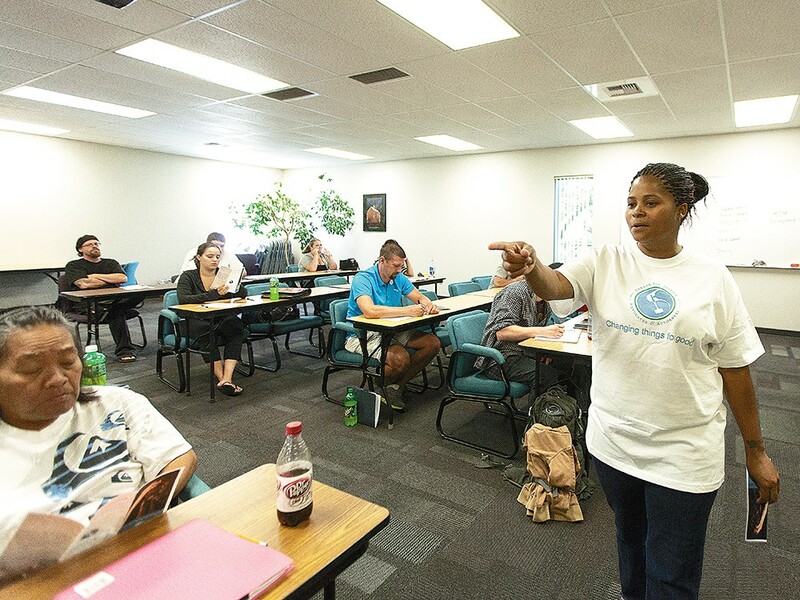 Spencer, who slaps her hands on the table as punctuation when she talks about her work, has a felony for rendering criminal assistance on her criminal record, but has since become a leader at Spokane’s nonprofit Center for Justice. She speaks to people at places like WorkSource, the Community Justice Center, Geiger Corrections Center, shelters and drug rehabilitation facilites about the center’s programs and sometimes about her own story. She had shared something with that woman from the courthouse: a connection few others have. But as she applied for housing, still pregnant and battling the January snow, landlords running background checks would see the conviction. “It was almost as if it was stamped on my forehead and there was no way to escape it,” she says. She finally found housing in an East Spokane apartment building run by the nonprofit SNAP — two days before her daughter was born — and started volunteering at the Center for Justice, where she learned she wasn’t alone. As an AmeriCorps VISTA volunteer, she met clients who couldn’t find jobs or housing because of their past lives. “I was exposed to all these issues, all these barriers that they faced, and nobody could help them. Nobody could help them,” Spencer says today. So in the face of her own struggles and those of every new client she met, she got more involved. The yearlong AmeriCorps program led to part-time and then full-time work at the center. Today, she’s the center’s outreach coordinator and runs its driver licensing program, helping people who’ve had their licenses revoked because of unpaid tickets get their licenses back. In a car-dependent, sprawling society, lack of a license can be the final strike for someone who’s already had trouble finding employment because of their criminal history. The city prosecutor’s office has a similar program, but disqualifies people who have crimes against persons on their records, so the center’s program becomes the last resort for many people. Spencer’s personal experience — she was relicensed through the center — makes her a unique resource. Still, there are unmet needs. Spencer says when she tells of her own struggles, women latch on to her. They’ll ask her to be their sponsor, their mentor or just to talk to them. It’s not a responsibility she can take on again and again, so she recently helped start a women’s group at the Center for Justice. The group invites women struggling with everything from mental health issues to body image concerns to depression to meet, talk and journal. They’re connected with each other and with resources, but most of all they’re heard. Because when you’ve lived the struggles of those in need, you know the value of a kind word or a hand up. “When I was a client that was hurting who needed somebody to listen to me, I wouldn’t share any of that information until I heard a person that I was able to relate to or connect with,” she says. Wed., April 24, 6-9 p.m.